I was amazed at the level of service that we received from the hotel. We stayed there for 7 nights and each day took our kids out and about. Since we weren't familiar with the area, the hotel was extremely helpful in providing us directions, ticket price information and even recommended places to eat etc. When we needed extra towels or extra blankets we received them within just a few minutes of asking. The pool was stocked with toys for the kids to play with. We loved it. Bed was slightly uncomfortable for me. Very upscale accommodations that is central to everything that San Diego has to offer (restaurants, shopping, entertainment & activities), would stay here again anytime. Centrally located and very helpful staff. The fact that you had to pay $13 to park on the property. Very nice pool area. Bedding is good quality. Higher floors have a nice view. The lower floors (mine) look over an ugly roof. Convenient to freeway. Parking was limited. My room was too far from the elevators. The stairs were right by my room, but they led to the kitchen area. 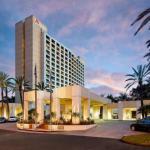 Great service, amenities and location will put Marriott San Diego Mission Valley at the top of your list. No matter you travel with family or you are on business, the hotel will exceed your expectations. Conveniently located near Fashion Valley Mall and connected to downtown by trolley, the hotel will make you live the San Diegan calm lifestyle in seconds. Friendly staff, great rooms and top notch amenities guarantees the visitor a worry free stay. Feel at home when you are not, and relax. Each one of the 350 rooms has a balcony from which you can enjoy the lush views of San Diego landscape. They include 17 rooms specially equipped for business travelers, five luxury suites and two concierge floors. In every room, enjoy Premier cable TV, individual climate control and great bedding. High Speed Internet access is available for a fee. Enjoy reading the morning newspaper in your room while you taste the coffee delivered daily in your room. The hotel is excellent for both families and the business traveler. Parents will enjoy the baby sitting services offered and laundry on site including several coin operated. Business travelers will appreciate the copy, printing and fax services available and the access to the business center. The hotel offers translation and notary public services too. Visit San Diego with peace in mind knowing that your valuables are kept in the front desk safe box. If you need a last minute souvenir from San Diego, stop by the in house gift shop. Spacious rooms and friendly staff seem to be this hotel's best features. It is well located, near the freeways, conveniently connected by trolley to the Gaslamp Quarter and other amenities in downtown, in minutes, you`ll be in the heart of San Diego. A plus, you are by San Diego`s most sophisticated mall: Fashion Valley. Breakfast is excellent and the food served is tasty. Parking: Yes, there is parking. Daily parking fee $13, you can park on the street, it is safe.